The issue of visitation schedules for divorced parents is one that can cause conflicts between former spouses. If the parents can't agree on a visitation schedule themselves, the court will impose one that it feels is in the best interests of the child. When a divorce occurs, everyone in the family has their life disrupted to a certain extent. The children, especially, need to have a sense of stability. They have the right to a relationship with both of their parents, unless there is a compelling reason why the non-custodial parent should be denied visitation rights. When a formal schedule is agreed to, the children know when they can expect to spend time with the other parent. The actual schedule will depend on the type of custody arrangement that is in place. If one parent has sole custody of the children and the other one has visitation rights, the children will likely spend less time with the non-custodial parent than if a joint custody arrangement has been agreed to. Once the type of custody arrangement has been decided, the visitation schedule can be discussed. 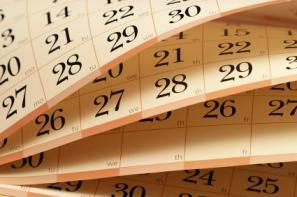 The regular schedule can repeat each week, two-week period or monthly. For some families, the non-custodial parent has visitation every second weekend and for part of one weekday. In situations where the parents have joint custody, they may alternate caring for their children on a weekly basis. Some families have worked out an arrangement where the children stay in the same home but the parents take turns living there and switch weekly to give the youngsters a greater sense of stability. There is no right answer to the question of making a regular visitation schedule. When working up a visitation schedule, the parents will also need to discuss how they will deal with visitation issues for holidays and special occasions that the children are expected to attend. Holidays include national and religious holidays. They also include times when the children are off school for a break. Parents should write down all of these events and make a note of times as well. For example, if they are talking about a child's Christmas break away from school, the first day of the holiday should be noted, as well as the day the child is supposed to return to school. Then the parents can discuss how they will divide up this time so that the child gets to spend time with each one. The same process can be used for summer holidays and any other time the child will be off school. Visitation schedules for divorced parents should also include vacation times as well. The schedule can include specific times that each parent books to take the child away on vacation, or each one can be entitled to a certain number of vacation days during the year to be scheduled later. Other provisions that need to be discussed when making a visitation schedule are the details about when and how the handover of the child should take place. The agreement may include specific times and places where this will be done. If the parents are not able to accomplish this goal without being civil, a neutral location may be specified for dropping off and picking up the child. The specific provisions of the visitation schedule will vary, depending on the needs of the family involved. Once the parents are able to establish a routine so that each of them can spend time with the children, the process of visitation should run more smoothly.